The Larchmont Bungalow is scheduled to be back in criminal court Mon., Aug. 7 with a new defendant — Renee Mizrahi, wife of the deceased owner. “That’s the drop-dead date when they’re supposed to be either in compliance by that date or close the restaurant. This has gone on long enough,” said Todd Maland, investigator with the city Dept. of Building and Safety. Last month the city attorney’s office was set to file a criminal complaint against Mrs. Mizrahi for violating a city order for illegally operating the Bungalow as a restaurant. Court Commissioner Elizabeth Harris continues to oversee the case, which originated when the late Mr. Albert Mizrahi opened the eatery as a take-out in 2009 with tables and chairs. In a sworn affidavit, under penalty of perjury and prior to the opening, he had acknowledged specifically that the facility would not have tables and chairs. The number of restaurants on Larchmont Blvd. is restricted under zoning laws. The restaurant limit was reached years ago, and only new take out establishments are allowed. 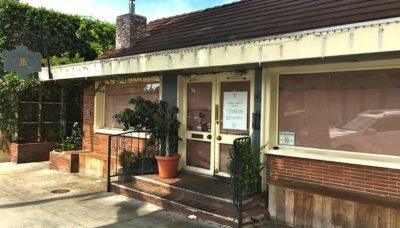 As a result of Mizrahi’s commencement of business as a restaurant and not a take-out, the city almost immediately revoked the location’s required certificate of occupancy, and the restaurant and its owner and the city have been mired in civil and criminal lawsuits for nearly eight years. Mr. Mizrahi and the restaurant have lost every case so far. The criminal complaints were filed in 2010 against both Mr. Mizrahi and his business entity, Larchmont Village Partners, LLC. The three criminal counts are for violating an order to comply with city codes, providing false information on required documentation, and operating without a permit. Mr. Mizrahi did not waiver from his initial “not guilty” plea, but his business entity did not contest the charges and was convicted in March 2016. The prosecutors agreed to probation for Mr. Mizrahi if the offenses were corrected. But the illegal restaurant continues to operate still. That original criminal case, in which there was a plea agreement with the two parties, was interrupted by Mr. Mizrahi’s death in August 2016. Initially, after the death, criminal defense attorney Richard Hirsch argued that the co-defendant, Larchmont Village Partners, LLC, was without a chief executive officer. Then, in March 2017, after city officials were notified that Mizrahi’s wife would be taking over, the officials again inspected the Bungalow, at 107 N. Larchmont Blvd. Finding tables and chairs, the city issued an order to comply to the LLC and to Mrs. Mizrahi, city investigator Maland said. City officials returned in April 2017, and there still had been no compliance. In court in April, Bungalow attorneys said they would either comply or close by the August deadline. At that hearing, Commissioner Harris dismissed the case against the late Mr. Mizrahi. “The case against the LLC is not dismissed. The court only dismissed the case against Mr. Mizrahi. The rest of the case continues. The case will end in August,” said deputy city attorney Serena Christion. Maland said the case soon would be settled in court, one way or another.